Here at Hello!Lucky we love giving back any time of year, but the holidays hold a special place in our hearts for helping out. From donating to our favorite charities to giving proceeds of our products to various philanthropic organizations, Hello!Lucky keeps busy! If you’re looking for a gift that keeps on giving, we have you covered. 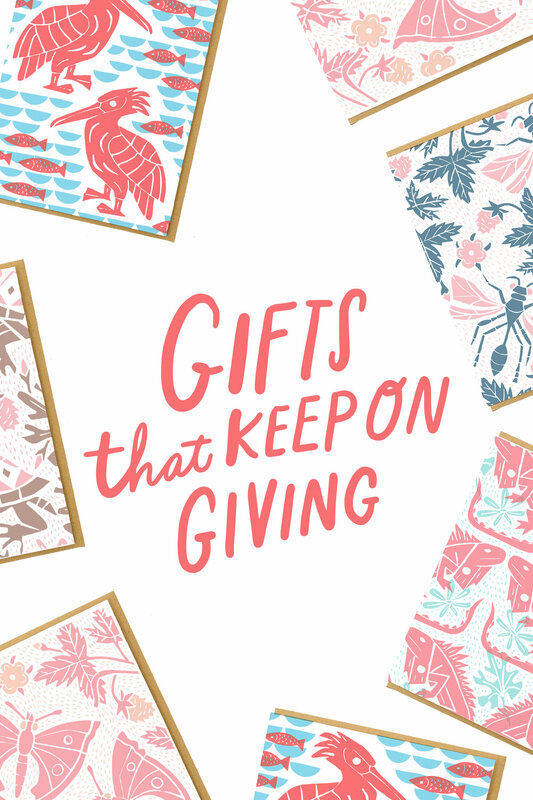 For nature enthusiasts, all of our greeting cards in “Ginny’s Collection” donates proceeds to The Nature Conservancy. The best gift for letter-writing fans who also want to help protect our natural resources. There are five designs to choose from in singles or sets of six. Mix and match to make the perfect gift. Enamel pin addicts will love our Wild Feminist and Stay Woke enamel pins. 100% of the proceeds from our Wild Feminist pin go to Planned Parenthood and the Stay Woke pin proceeds go 100% to The ACLU. So you won’t only be getting high-quality enamel pins made in the U.S, but also donating to a good cause as well! Or ditch the gifts this year and go straight to the cause! There are tons of organizations and programs out there worth donating to, but here are some of the causes we love. Donate to a cause you care about in the recipient's name, or send your friends a family a wish list if they’re asking.